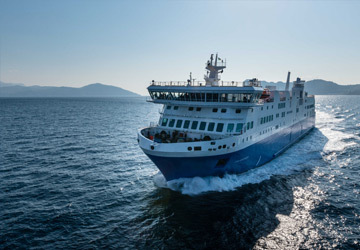 The Folegandros Paros ferry route connects Cyclades Islands with Cyclades Islands and is currently operated by 2 ferry companies. 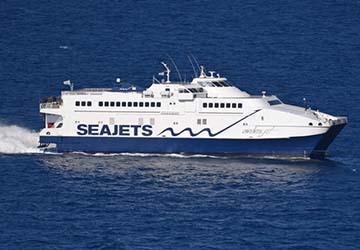 The Sea Jets service runs up to 2 times per week with a sailing duration of around 3 hours 25 minutes while the Hellenic Seaways service runs up to 1 times per week with a duration from 4 hr 40 min. So that’s a combined 3 sailings on offer per week on the Folegandros Paros route between Cyclades Islands and Cyclades Islands. Compare now and get the best fare at the time that you want to travel. Prices shown represent the average one way price paid by our customers. The most common booking on the Folegandros Paros route is a car and 2 passengers. Located in the Cyclades group of islands, the Greek island of Folegandros lies in the Aegean Sea and forms the Cycladic island chain along with the islands of Sikinos, Ios, Anafi and Santorini. It is a fairly small island, measuring around 32 sq. km, and has around 760 inhabitants who primarily live in three villages: Chora, Karavostasis, which is also the island's port, and Ano Meria. For visitors to the island looking for a vantage point to take in the island's magnificent scenery then the Church of Panaghia is located on the top of a hill and offers great views of Chora and the island's west coast. There are a number of great beaches on the island but visitors should note that all of them are fairly difficult to reach. Some can be reached after a bit of a walk whereas others can only be accessed by boat. The two beaches that can be reached by car are the beaches at Karavostasi and Angali. The island can be reached by conventional ferry, Highspeed ferry or Flying Dolphin from Piraeus, Rafini, the other islands of the Cycladic islands, Crete, Rhodes and the rest of the Dodecanese islands and the East Aegean Islands. 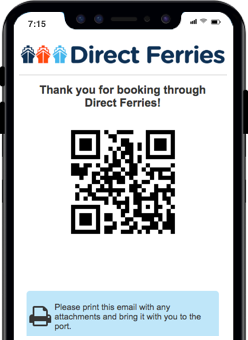 Travel times vary depending on destination and ferry type but journey times range from 3.5 hours to 11 hours. The island's harbour, Karavostasi, has a few shops and restaurants for visitors to enjoy. The Greek island of Paros is one of the Cyclades group of islands and lies in the Aegean Sea close to the island of Naxos which is about one hour away by ferry. It is a popular holiday destination and has a reputation for being a friendly island and very welcoming to its visitors. It is the second largest of the Cyclades and has many things to see and do including taking part in the many different water sports that are on offer. There is also the Church of Panagia Ekatantapiliani which dates back to 326 AD and is also popular with tourists. For a relaxing way to spend your time on the island there are some lovely tavernas that line the Parikia seafront and also some lovely beaches that include Agia Irini, Farangas, Kato and Logaras. The island's port is in Parikia and hosts both conventional ferries and high speed ferries. 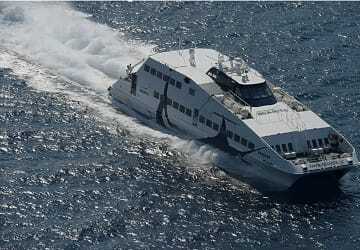 Ferries generally depart to Piraeus and to the other islands of the Cyclades.